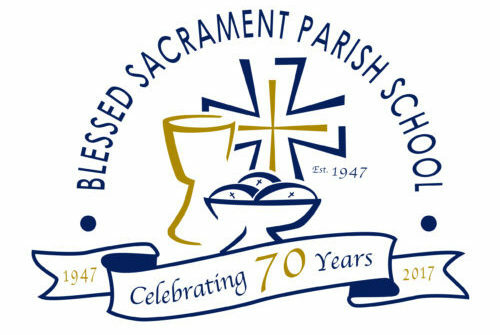 Blessed Sacrament Parish School was established in 1947 and staffed by the Sisters of the Immaculate Heart of Mary with grades one through eighth. In 1974, the Sisters of the Immaculate Heart of Mary withdrew from the school and the first lay principal was hired. In September of 1977, the Kindergarten was opened. The Preschool opened in 1981 and was later expanded to include a pre-Kindergarten. In 1986, the Preschool was fully licensed by the State of California. A ninth grade was added to the school in 1984. This program continued as a necessary component to meet parent and student needs until 1991. In 1993, construction of a 6,800 square foot building began that was designed to house three new classrooms, administrative space, a permanent lunch room, designated parish multi-use space, and a new Computer lab.A new building was completed and a portable building was secured in 1986 which provided one additional classroom and space for the Extended Day Program. As the Preschool numbers increased and the pre-Kindergarten program was established, additional classroom space was outfitted to meet those needs. In the summer of 2007, a grant proposal was submitted and approved by the First Five Commission of San Diego which allowed for capital improvements for our preschool program. Work was begun in the summer of 2008 which included upgrading of electrical power, extension of internet access to rooms, installation of air conditioning units, new cabinets and shelving units, and canvas shading of play structure yard. Also in 2007, the Blickenstaff family donated $1.5 million to establish the Brian’s Scholars Foundation, in honor of former Blessed Sacrament Parish School principal Dr. Brian Bennett. The endowed scholarship program allows students in financial need to receive a Catholic values-centered education at Blessed Sacrament. Over 68% of the students’ families are registered in Blessed Sacrament Parish and another 18% are registered in other Catholic parishes. Additionally, the staff has grown from twelve full and part time teaching staff and office personnel to twenty-six staff members. Blessed Sacrament Parish School continues to accept the challenge of providing Catholic education opportunities to the faith community which we serve, and we welcome your prayers, participation and support.